This article originally published in The Australian. Andrew Muir could have done a lot of things after pulling off the huge $870 million sale of his and his family’s Good Guys retail chain only two years ago. 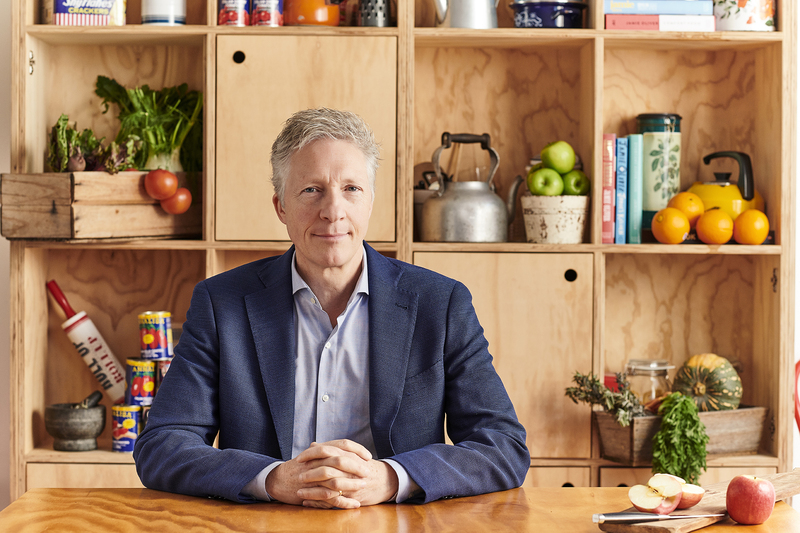 Few would have expected him to embark on a crusade to get Australia’s children to eat more vegetables and try to help fix the country’s worsening obesity crisis. And the thought of Muir, a quietly spoken and charismatic — maybe even a little eccentric — rich-lister, teaming with British celebrity chef Jamie Oliver may seem even stranger. Since selling Good Guys in September 2016 and then a portfolio of properties for another $92m a year later, Muir has moved his retail attention to the Best Friends pet care chain he owns with private equity firm Archer Capital and free technology start-up Momatu. He is also a director of AFL club Essendon and has been linked — erroneously, Muir claims — to a bid for lower league English soccer club Charlton Athletic. Food is his passion though, Muir says. He has funded what he claims has been a successful pilot program in primary schools to encourage children to eat more vegetables — something he has wrestled with himself with a young family — and now wants government support to take it further. He explains how a career in retail has led to him putting plenty of time and money into his Good Foundation, a charity focusing on programs and projects promoting good health and nutrition through food education. “We had a retail offer that was a compelling one that customers wanted to come back and shop at over and over again. It was a fun brand that laughed at itself a bit, had a great price proposition — pay less, pay cash and the like — and all those other things we got right over 65 years. That led to the establishment of the Good Foundation in 2010, after which Muir started working on the idea of getting a well-known chef involved to help lead the charge. After looking at high-profile chefs in Australia and around the world, Muir settled on Oliver, enjoying his knockabout larrikin image — “he should be an Aussie really” — and popularity with women and children. Muir reels off the statistics from the cooking centres, revealing 50,000 people have taken part in the 10-week program, which has sites in Queensland and Western Australia. A study by the Deakin Population Centre and the University of Melbourne found participants made more home-cooked meals, increased their vegetable consumption, and ate less takeaway food — habits they maintained six months after the program. But Muir gets even more excited about his latest venture with Oliver, the pilot Learn Your Fruit and Veg Program. It has been introduced across 19 early learning centres and primary schools in Victoria and Queensland, with 5750 students taking part in 230 classes over two months. Muir says a University of Leeds study showed exposing infants to vegetables early in life encouraged them to eat more of them, and would like to see the program introduced in schools across Australia as it has been in Britain. But he admits to being frustrated in his dealings with government authorities on the matter. “We need a champion. We are trying to do that at our level but we need a government at some level to step up and do it. The program is an intervention and just an intervention will not do it on its own. Muir’s other project is the free app Momatu (“Moments that matter to you”), which will launch in early November. Otherwise, Muir is still getting his retail fix through Best Friends, a pet-care chain that includes grooming, veterinary and puppy training skills.